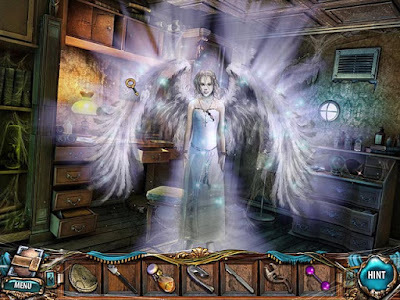 New hidden object and adventure mystery hybrid game, Sacra Terra Angelic Night is one of the best mystery PC games of 2011 so far! Starting in an old decaying mental hospital with the help of an angelic spirit you must defeat the scary demons of the 7 Deadly Sins! This mystery game has it all, from the compelling storyline and the challenging gameplay - both hidden object and point-and-click adventure to the atmospheric background music and beautiful graphics. This is a brilliant mystery adventure game with a totally immersive fantasy atmosphere and so many hours of games to play. This is much much more than the usual mystery adventure games for PC. My choice for the best mystery PC games of 2011 so far! Plot: Danger has come to the world of Sacra Terra when demons of the seven deadly sins have broken from their fiery prison and taken up residence. In this horror adventure mystery, it is up to you with the aid of an apparition called Angel, to combat each demon. By searching hidden object scenes for clues and solving a unique assortment of puzzles, you must try to crack the mystery of how the demons escaped their prison, how to get them back in again, and save Sacra Terra from complete destruction! Point and click on various items to glean additional info from them, use the in-built map to be able to view the areas where you have tasks to be completed and if you need it there's a hint button to help with both HOG areas and the main areas too. You can also choose the difficulty level - choose easy level if you want 'sparkles' to indicate where there are HO scenes or items of interest and also for a quicker load up time of the hint button. There is very little dialogue, instead you discover the story behind the mystery by collecting bits of notes that you find scattered throughout the locations. These are automatically stored for you in your notebook, which will be useful as you'll need to refer back to them as you progress through the adventure. * My review: This is such a beautifully detailed atmospheric adventure game with an engaging ghostly story. The fantasy horror feeling of it is enhanced in a number of ways - by the illustrations, the music, the locations - such as the asylum and it's eerie catacombs, a medieval abbey and a graveyard, the haunting characters and by having virtually no dialogue. As for the gameplay this is quite substantial with hours and hours of gameplay and includes interesting puzzles, some that use your inventory items and loads of challenging hidden object scenes. The Collectors Edition also has extra gameplay, artwork and an in-built strategy guide. 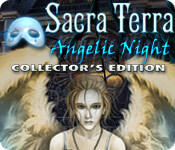 * For free demo/full version download for PC visit: Sacra Terra Angelic Night. See also my Sacra Terra Games Series List. HOP games for PC and Mac. From Alawar and Five-BN.